A spokesperson for the RCMP detachment in Churchill, Manitoba has informed the press that Saint Nicholas, under detention for entering Canada without proper documentation, has now been charged for operating a skidoo under the influence. Santa’s lawyer, Edward Greenspan, is away in Ottawa, presumably in negotiations with Foreign Affairs, Trade & Development Minister Baird, over Saint Nicholas’ possible application for Canadian citizenship. Spotted by the press at Ottawa airport, Greenspan would not confirm whether he was heading back to Churchill or was heading to Toronto instead. Meanwhile, Minister Baird is bunkered down at Foreign Affairs, awaiting a Russian delegation that is due later tonight in the nation’s capital to discuss the two nations competing claims to the Arctic. Foreign Affairs spokesperson John Babcock, who handles circumpolar affairs, denied that the government is being pressured by both the Russians and the Americans to state that Santa Claus is “a stateless person with well-settled rights that should be respected by all members of the international community,” in the recent words of Secretary of State John Kerry. “Canada is a trustworthy team player in matters of border security, and our partners and friends in Washington understand that,” was all Babcock would say. Meanwhile, it appears that Saint Nick succumbed to a little cabin fever after almost a week of being sequestered at the Northern Studies Centre, 20 odd km outside of Churchill. After an early dinner of venison steak with ice wine and a St. Remy’s Delight - a la crème brandy, maple syrup liqueur, milk, and cocoa - or two, he reportedly insisted on taking a skidoo out for a night ride. After being gone for more than 30 minutes, administrators at the centre contacted the local RCMP detachment who managed to chase down and detain the bearded saint. 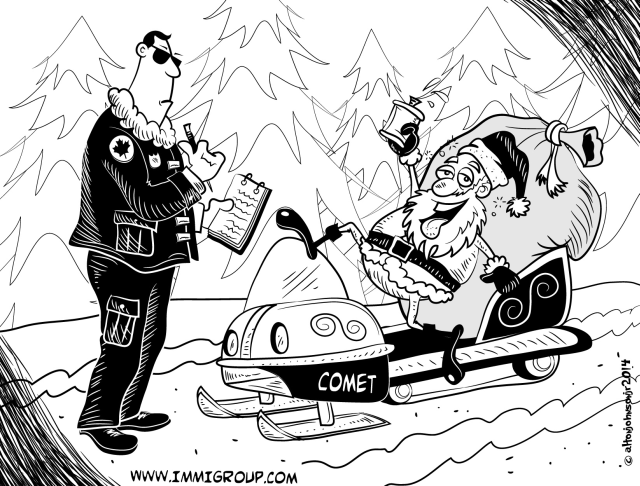 He failed an alcohol test back at the detachment’s facilities but apparently, “was affable and cooperative and did not resist arrest.” How exactly this will affect the fate of Santa Claus’ application for citizenship is hard to predict, but it will certainly not help. If Greenspan’s strategy is indeed to have him registered as a “lost Canadian”, then he may not face deportation as a result of the DUI charge. But that remains to be decided by both the local and federal authorities. Edward Greenspan, Santa’s legal representative, has hit back hard at the local RCMP and the Northern Studies Centre’s administrators, alleging “incompetence and abuse of authority” and demanded to see the results of the blood test. Aside from blaming the Northern Studies Centre for allowing Santa access to the ski-doo in question, he is suggesting that the so-called “Clausian exception” that has granted Saint Nicholas freedom of movement across international boundaries in recognition of his status as a cultural institution, also gives him the right to operate vehicles while under the influence of alcohol. “It is a well-known tradition that Saint Nicholas has a flask of cognac in the glove compartment, if you will, of his sled, and avails himself of it on his nighttime voyages during Christmas Eve. And further, there is a tradition of sharing a tipple with the officials at any refueling station, precisely like the one here at Churchill. What happened two nights ago was a clear continuation of this recognized tradition, a tradition that enjoys the protection afforded by the Clausian exception. I will ensure my client’s rights in this regard are respected.” When asked if Saint Nick enjoys a form of diplomatic immunity, Greenspan responded, “If you can think of a diplomat who has brought more peace and joy to this world, let me know will you?” Members of Harper’s Cabinet, especially Baird and Kenney, have remained tight-lipped for now, but sources near the Conservatives suggest that the Prime Minister is furious at the local RCMP for having exacerbated an already complicated situation. The sources also state that Ray Novak, Harper’s trusted chief of staff, is now in charge of the Santa file and that Baird must report directly to him rather than the Prime Minister. Until the ski-doo incident, Novak, a committed monarchist, had been lobbying the UK for their support on Saint Nicholas’ citizenship. He now has the full file under his control, but it comes at an embarrassing time for the government who had hoped for a low-key campaign to convince the USA and the UK of their claim to Santa’s citizenship. He will have to neutralize what has proved a field day for stand-up comics, especially in the US, where “Is Rob Ford really Santa?” jokes are proliferating across social media and on mainstream media as well. Even Bank of England Governor Mark Carney, the former Bank of Canada Governor, has had to endure a few skidoo jokes during board meetings, rumour has it. It will now be up to the local courts and the RCMP in Churchill to decide whether to press forward with the charges, or as is widely expected, to have them dropped.